Good news via Streetsblog: the United States FRA are nearly done revising safety regulations which would allow for operation of high-speed trains in the United States! 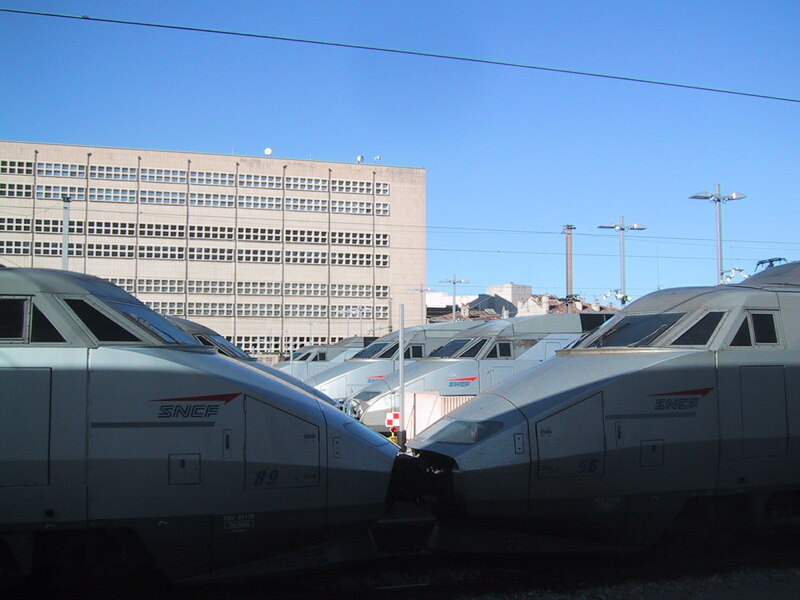 A fleet of TGV waiting to serve passengers in Marseilles, France in 2002. These trains have a top speed of 200 MPH. Proposed US safety rules would permit lighter, faster trains that meet European safety standards to run at speeds of up to 220 MPH. Current US regulations, from the 1800s and the 1930s, mandate heavier trains to survive crashes. Unfortunately, heavy trains cost more to build, operate, and maintain. Heavier trains are also harder to stop in an emergency. European train safety regulations are comparable to modern cars: lighter trains are cheaper to build and operate, and they stop faster. They feature “crumple zones” to absorb damage in an accident. Since the United States is a small market for passenger trains, divergent safety standards make it even more expensive to buy trains. Instead of purchasing inexpensive, reliable, “off-the-shelf” European-designed train sets, vendors need to make alternate, heavier, slower, more expensive designs for American railroads. The adoption of European safety standards will make it cheaper and easier for American railroads to provide modern, comfortable, faster passenger service. In anticipation of these new rules, Amtrak in September announced the purchase of 28 Avelia Liberty trains from the French company Alstom. The trains will be manufactured in upstate New York and will be used for Acela service starting is 2021. These trains can be upgraded to run at 220 MPH, but this will only be allowed after right-of-way upgrades on the Northeast Corridor. These rules coming at the end of the Obama administration, with promises of infrastructure spending under the Trump administration, could help American rail transport see more rapid improvements in short order. Friend: Dang it Apple my iPhone upgrade bricked the phone and I had to reinstall from scratch. This is a _really_ bad user experience. Friend: I had to do a factory restore through iTunes. Me: That’s not bricked that’s just extremely awful software. Friend: With Android phones you are constantly waiting on the carriers or handset makers for updates. Me: That is why I buy my phones from Google. Friend: Pixel looks enticing, I still like iPhone better. I am a firm believer that people stick with what they know, and you are unlikely to sway them if it works for them. Me: Yeah just because you have to reinstall your whole phone from scratch doesn’t make it a bad experience.